Lucky Club Casino (www.luckyclub.eu) launched on a new software platform today, bringing its players a mind-boggling suite of entirely new online casino games. The casino’s new “metro-style” design appeals to the iPhone / Windows8 generation that has been attracted to the trendy, upscale site. Initial reaction to the slick new design and the brilliant new games has been overwhelmingly positive. “This is great, a sweet new set of casino games to play. Love it!” said one player on re-opening day. Lucky Club management assures players that, although the games are all new, there is still the same strong commitment to friendly, efficient customer service and hassle-free withdrawals and deposits for players around the world. To get things off to a good start, Lucky Club Casino is giving all players a 100% Welcome Bonus. Lucky Club Casino has 30 video slot machines from Nuworks Gaming, including “Monster Millions” which features a large progressive jackpot. There are also three video poker games (Deuces Wild, Jacks or Better, Joker Poker) and four table games (Baccarat, Blackjack, Let ´em Ride, Tri Card Poker). New online slots African Skies, Greek Goddess and The Duck Ages feature the 5-level, interactive progressive jackpot game “Jackpot Pyramid”. 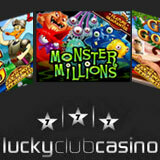 The new online games from Lucky Club Casino look great!